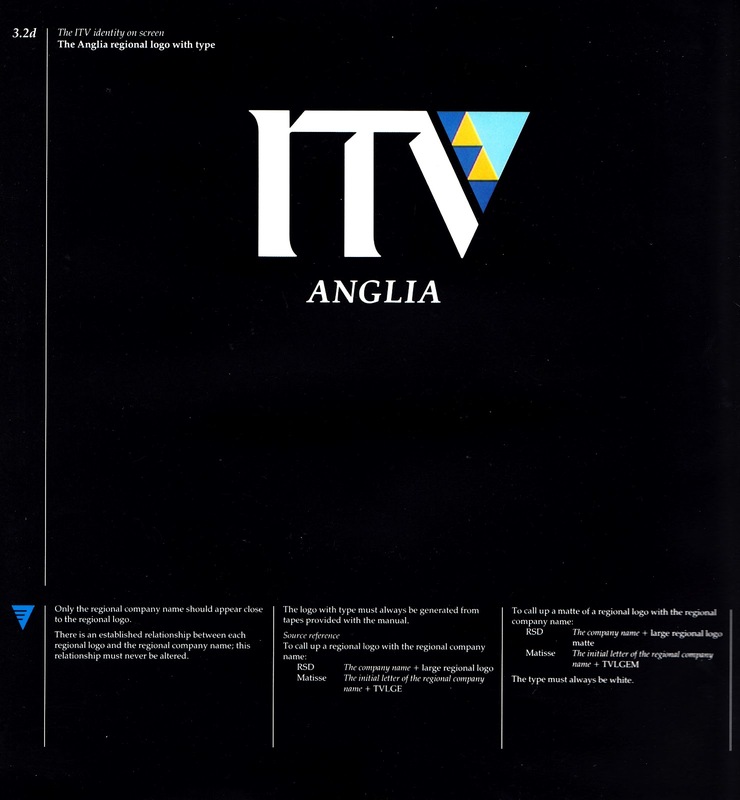 Here's an interesting oddity I picked-up a few years ago online: two pages (four printed sides) from the 1989 ITV STYLE GUIDE relating to ANGLIA TV. 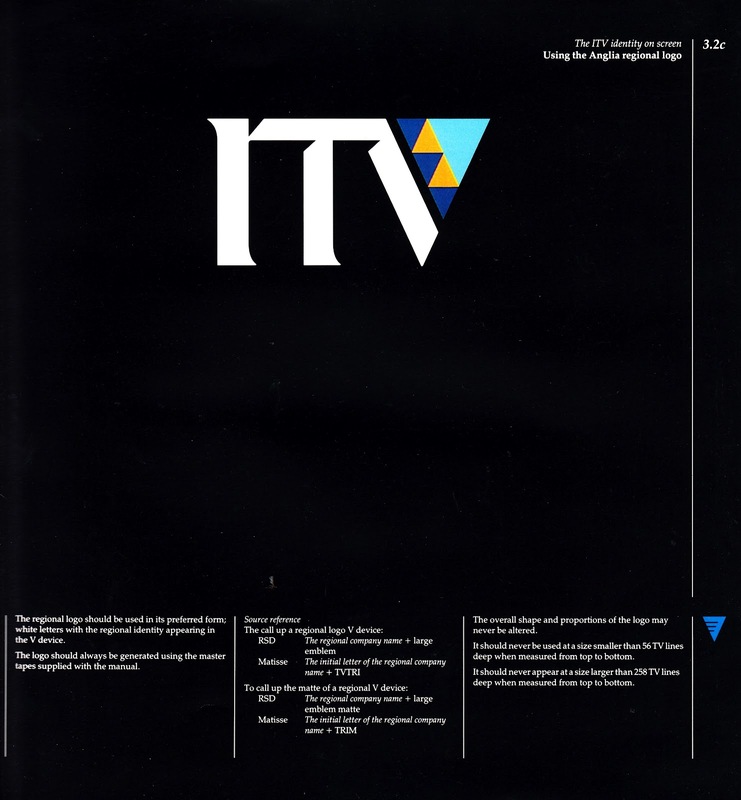 Although often referred to as ITV, and occasionally used on-screen as an overarching description of the 15 regional companies (plus TVam the breakfast contractor and ITN, the news service*) that made up the network, 1989 was the first time that ITV had tried to roll-out a consistent national brand across all regions. Needless to say, it didn't quite go as planned. 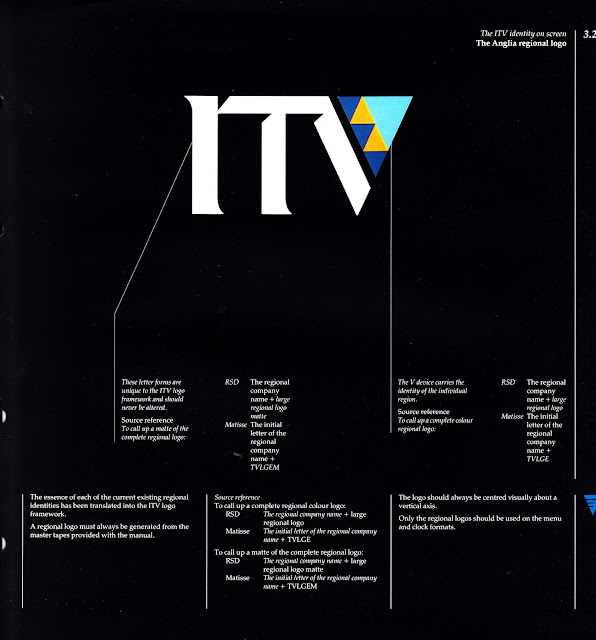 The idea was simple enough: every region would use the ITV logo on-screen but each version would be slightly different, using the "V" to incorporate elements of their existing branding. A clever, in the circumstances, solution. However, at this point in the broadcaster's history it was still (unlike today) a loose affiliation of independently owned and managed regional operations, each of which holding (but not owning) the license to broadcast in their own geographical area. As a result, not every region adopted the new "house style". 1. 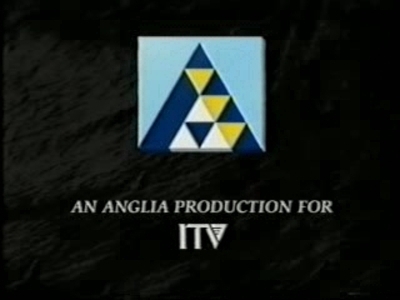 Anglia Television, covering the East Anglian region, was 'my' ITV broadcaster growing up. 2. Anglia never adopted the on-screen look shown here. 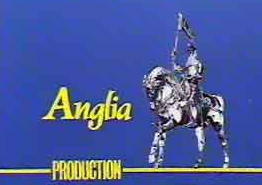 Anglia launched, in October 1959, with the classic knight-on-a-horse statue on-screen identity. Amazingly, the knight survived, virtually unchanged, well into the 1980s. This left Anglia looking increasingly anachronistic compared with its slicker neighbours to the north(ish) (Central) and south (LWT). In 1988, the company drafted in designers Lambie-Nairn to overhaul the station's entire on-screen look. The tradition of the knight was retained in the new design: a heraldic pendent (known to viewers as the "Anglia flag") which fluttered on-screen in all its CG glory. Continuity announcers, previously normally seen in-vision, were relegated to voice-only work (except during the long gaps between programmes in the overnight schedules). With such a radical overhaul only a year old, it was probably no surprise that Anglia's powers-that-be rejected the opportunity to jump aboard the national brand. Copies of the full style guide (or "manual" as it describes itself) were presumably dolled out, along with the requisite video elements on tape to the presentation departments of each company. The guide was intended to show/ remind each company how the logo was to be used on-air, preventing inconsistencies and brand no-no's when unleashed onto 15 different Graphics teams. Here, courtesy of You Tube, is a nice compilation of Anglia's on-screen identities. * Both of which sat outside the main ITV structure: ITN was jointly owned by the regional ITV companies to provide them all with national and international news bulletins. 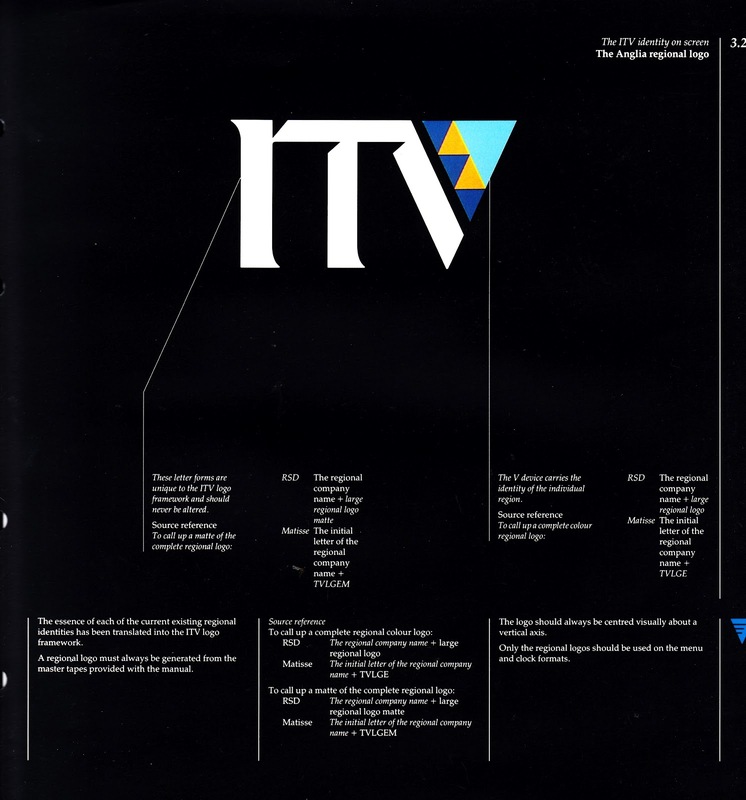 TV-am held the national breakfast franchise (operating across the ITV network from 6-9.25am seven days a week) and sold its own airtime, an arrangement that put it in direct competition with the regional broadcaster's airtime sales teams (who also, at this point, also sold Channel Four's advertising space). Hello, fascinating blog which I found completely by chance! 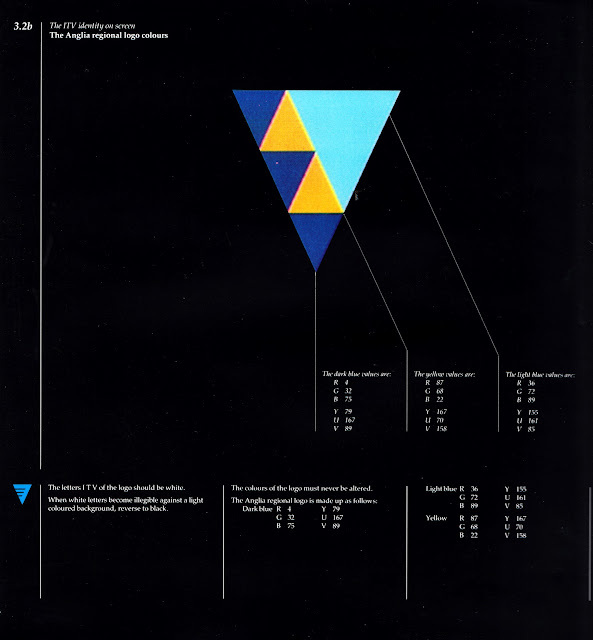 Have never seen any extracts from the 1989 style guide before so this was really interesting - thank you for posting. I worked in Anglia presentation when transmission came from Meridian Southampton in the late 90s/early 2000s. I loved the 'flapping flag' ident and glad Anglia retained it as long as they could, although this ITV version looked a great deal better than the logos offered to most regions as part of the same package.